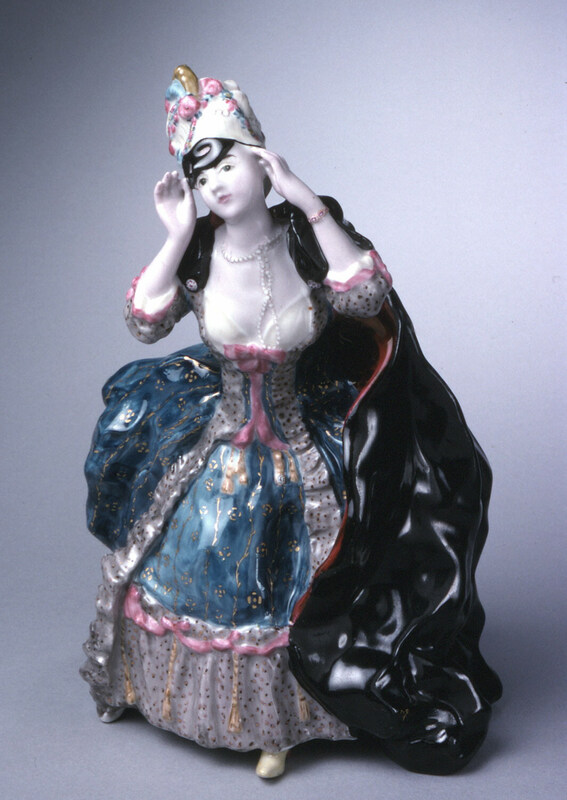 See more objects with the tag decoration, identity, mask, female, porcelain, disguise. See more objects with the color darkslategrey darkgrey cadetblue grey cadetblue or see all the colors for this object. This is a Figure. It was designed by Konstantin Andreievich Somov and manufactured by State Porcelain Factory. It is dated 1905–06 and we acquired it in 1989. Its medium is porcelain, enamel, gilding. It is a part of the Product Design and Decorative Arts department. underside: Provisional Government mark obscured by green enamel circle; hammer, sickle, cog, 1918 hand-painted in blue overglaze.